To or upgrade NetPoint, administrator rights are required. If you do not have administrator rights, either an administrator must login to perform the installation or you must be granted administrator rights on your local machine. If this is the case, please contact your IT department or system administrator. Once installed, administrator rights are NOT needed to run the software. For import/export, any necessary privileges will be set automatically upon installation. To check what version you’re running, go to Help > About NetPoint… from the menu bar and check the release date at the top. NOTE: For NetPoint to launch properly, Windows must have a “My Documents” folder defined within the user directory, as this is where NetPoint will stores recovery files. Otherwise, NetPoint will not be able to successfully initialize. 1. Click or paste the download link into your system’s web browser. For installing or upgrading a licensed version, enter the credentials in the security window and click Log On. NOTE: The trial does not require credentials and should begin downloading automatically. 2. In the confirmation pop-up, click Run. 3. When the download finishes, click Actions. 4. When the filter window opens, click Run Anyway. 5. If the User Account Control window opens, click Yes. 6. 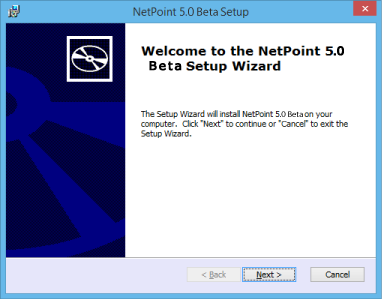 NetPoint setup will begin. A series of notifications will appear.Click OK for each one. 7. In the NetPoint Setup window, click Next. 8. 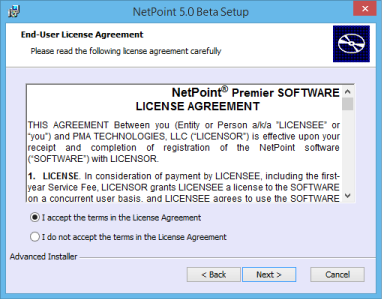 Check the option next to I accept the terms in the License Agreement and click Next. 9. Leave the location as default or browse for a new one, and then click Next. 10. Configure the shortcuts or leave them as default, then click Next. 11. Begin the installation by clicking Install. 12. 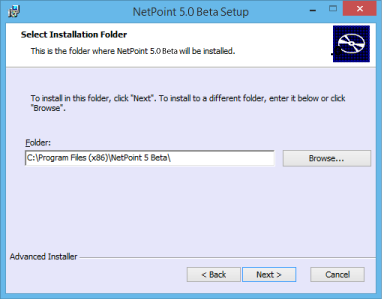 During installation, NetPoint will open momentarily for entering some system defaults. Enter your name and email and click OK.
14. Check the option next to Launch NetPoint and click Finish. By default, all activities and milestones in NetPoint are assigned a calendar when they are created. Click the down arrow button and choose a country to use as the basis for the workweek and holidays for the default calendar. From within NetPoint, custom calendars can be created with custom workweeks and holidays, and any of these can be set as default for the schedule. See [bookmark postid=”11533″ anchor=”calendars”]Project Calendars[/bookmark] and [bookmark postid=”12479″ anchor=”default-properties”]Setting Default Properties[/bookmark] for more details. If your version of NetPoint includes PolyTime, you will also be able to set a default time unit for new schedules. Click the down arrow button and choose a time unit to apply to all objects in the schedule. Unlike calendars, the time unit cannot differ from activity to activity. From within NetPoint, a different time unit may be chosen at any time during planning. See [bookmark postid=”12362″ anchor=”units”]PolyTime[/bookmark] for more details. NetPoint has the capability to send email notifications. Enter the name and email address that will be used to identify the sender. From within NetPoint, a different name and/or email may be used each time an email notification is generated. See [bookmark postid=”932″ anchor=”notifications”]Resource Notifications[/bookmark] for more details.